When disclosure happens, the life you thought you had seemingly crumbles in your hands. It's like the floor caves underneath you and you're in a free fall. The chaos, the fear and the dread, it can seem as though you're stuck in a vortex of chaos and agony looking for any sort of relief. You feel like you can't tell anyone, and those that you do tell, can't remain objective. "If it were me, I'd divorce him." they say . . .
"I'd be done with her if my wife did that to me" they chant . . . The fact is, everyone says what they would do if infidelity transpired, until it actually happens to them. Where do you turn when infidelity and uncertainty knock on your door? 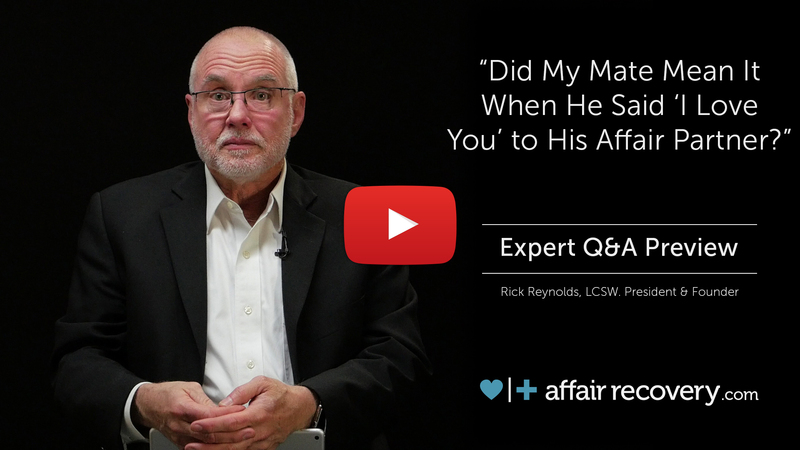 This week, I'd like to share with you three helpful videos specifically for the betrayed spouse. If you're in pain due to infidelity or addiction whether you're male or female, you are likely feeling alone and thrown to the wolves to fend for yourself. But, you don't have to be. There is hope and there is an online course to help you heal and quite possibly, help your relationship heal. 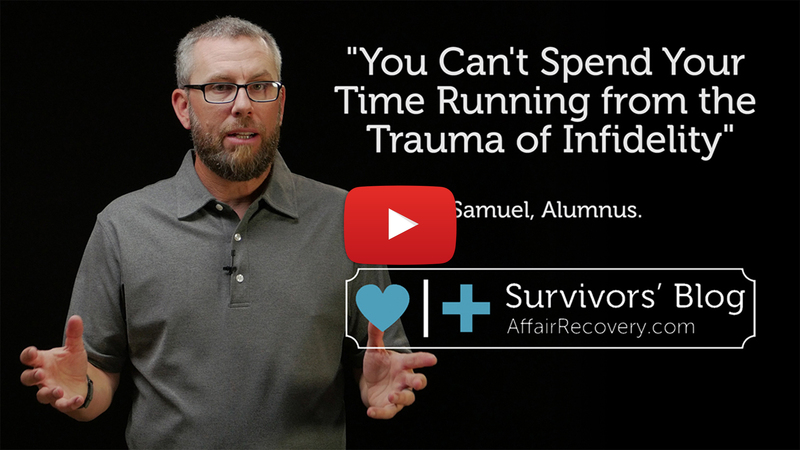 I hope you'll take a few minutes to watch these videos, taking into account that at AffairRecovery.com, we value being a safe place for both the unfaithful and betrayed, to heal and find new life for your own recovery and even your relationship. 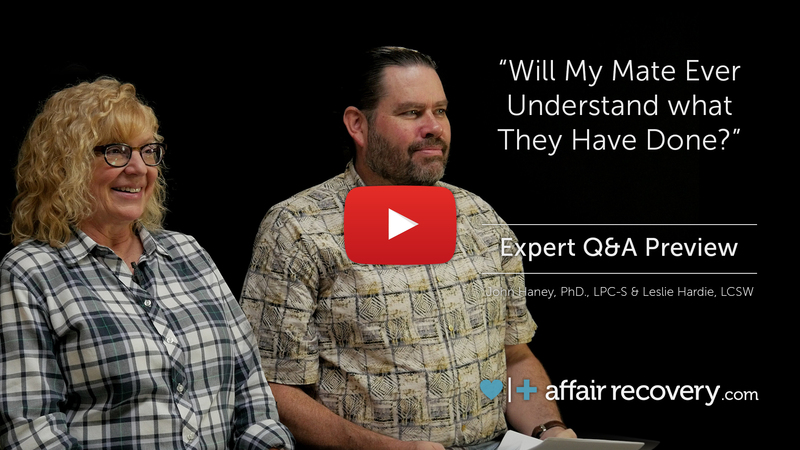 Affair Recovery offers a weekly Expert Q&A with many of our subscriptions, courses, and retreats. Find out more in our Programs and Courses section. Our Harboring Hope course includes an additional monthly Expert Q&A with the authors of the course. This resource is private and only accessible to those participating in Harboring Hope which makes it a safe place to ask your important questions. Our YouTube Channel is a great place to stay up to date with our free videos. If you haven't subscribed yet, we encourage you to. I'd like to introduce you to our program specifically for betrayed spouses called Harboring Hope. It's a 13 week, online course, specifically designed for those who are on the receiving end of infidelity and betrayal. You'll find expert care, objectivity, small groups assigned by gender, and all of it in a safe place for you to heal. We can't control what our spouses do, but we can control what our own response to infidelity or addiction is.